Anthony Merriweather was born on 10 March 1893 to parents William, a joiner, and his wife Annie Elizabeth. He was christened just over a month later on 21 April. Both William and Annie were originally from Yorkshire, but moved to the North East before starting a family. In Hartlepool, Annie gave birth to Anthony and his sister Ellen. By the time of the 1911 census, the family were still living in Hartlepool, at the address 32 Osborne Road West. Anthony’s occupation was listed as being a shop assistant at Boots Trade. His sister, Ellen, was working as a dress-maker, while the family also had a boarder living with them named Jane Wilson. 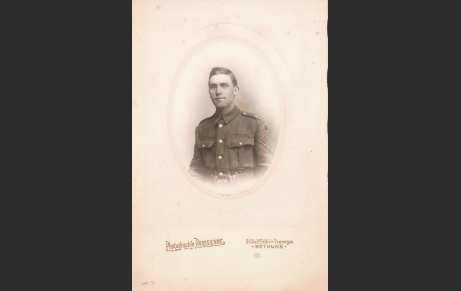 22 December 1915 saw Anthony, aged 22, joining the British Army during the First World War. He joined at the rank of private in the 18th (Pals) Battalion Durham Light Infantry, service number 18/801. He would go on to serve in France for almost the entirety of the War, only briefly returning to Britain on leave. On 29 January 1918, Anthony was discharged to commission, rising to the rank of 2nd Lieutenant and swapping to the 7th Battalion Wiltshire Regiment. Anthony survived the remained of the war, returning to the Britain and eventually resettling in Scarborough. He died in 1969, aged 76. For his service in the war, he received the 1914/15 Star, British War Medal and Victory Medal.